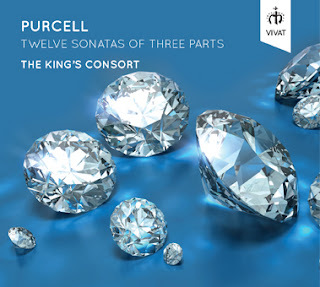 Rather appropriately Robert King and the King's Consort have followed up their fine recording of Purcell's Sonatas in Four Parts (see my review) with a recording of the Twelve Sonatas in Three Parts on the Vivat label. The performers being violinists Cecilia Bernardini and Huw Daniel, bass viol Reiko Ichise, theorbo Lynda Sayce with Robert King on organ. Though the ten Sonatas in Four Parts were issued posthumously by Purcell's widow in 1697, whereas Purcell supervised the publication of the twelve Sonatas in Three Parts, both groups were almost certainly written at the same time probably in a single great burst in the early 1680's. In his excellent booklet not Robert King suggests that the court's summer recess to Newmarket would have given Purcell the space. The titles of the two groups of works are confusing because both are in four parts with a basso continuo part which is separate from the bass viol part. In his introduction to the 1683 publication Purcell explained that the sonatas were re-written to include this extra part (rather than the bass viol part following exactly the basso continuo part). Probably as a result of Purcell seeing Corelli's first set of Sonate da chiesa which were first published in Rome in 1681. The idea of separate basso continuo part written out was new in the UK and Purcell takes full advantage. The bass viol part is developed to be almost the equal of the violins, leaving the continuo to be more slow moving, strengthening the harmonic bass of the works. What amazes when listening to this music is Henry Purcell's youth (he was 24 when the sonatas were published) and his remarkable fecundity. There are 24 tracks on this disc, though many are sub-divided into smaller units, and Purcell never repeats himself. Each movement brings forth a different feat of imagination. There is no sense of a standard model, the opening movements for instance do no all fit the same format. Thou he learned from the examples of his predecessors, these works clearly leave the world of the viol consort behind and, fertilised by the example of Corelli, Purcell seems to have foun the open field a stimulating challenge; nothing need be the same again. Robert King uses both the organ and harpsichord, choosing different instruments for different sonatas, and joined by Lynda Sayce on theorbo. When the organ is used the continuous nature of the organ's sound means a more solid harmonic basis. The violinists, Cecilia Bernardini and Huw Daniel intermingle their lines with some lovely rhythmic impetus and a great appeal. Not to forget the bass viol player, Reiko Ichise provides a strong contribution. The group plays this music with fluent engagement and a lively sense of discovery. You never feel these performances are routine, and I for one will never tire of them. What was lovely about listening to this disc was they way that different movement conjured up memories and pre-echoes of other Purcell works. He has not cast off his forbears, what you get from these works is a wonderful fecund fusion, the English consort transplanted to Italian soul and grown by a genius into something new. This disc is essential listening and if you have not got the previous one then buy it!